« When will Seeds Aside go extinct? Kiwano is the fruit of Cucumis metulliferus, or Horned Melon. I have known the fruit for a long time without ever affording one (this was more because I couldn’t find it, though the price would have made me think twice before buying one). 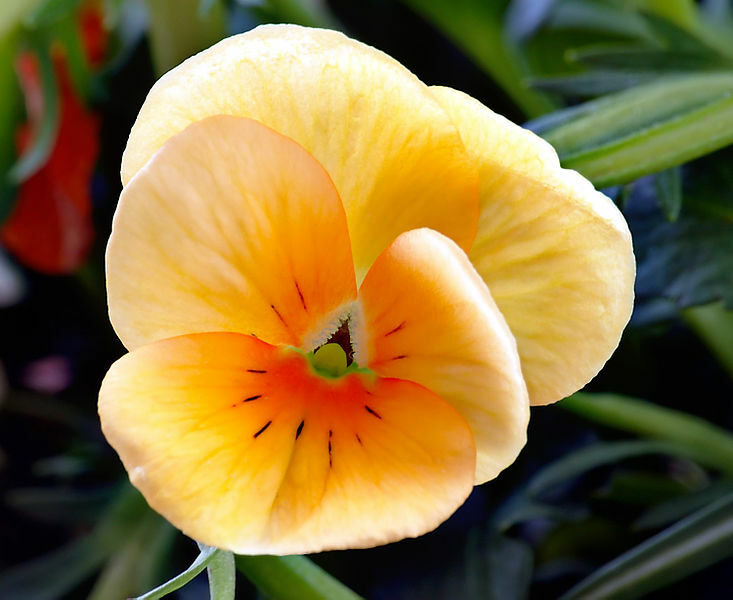 It is very attractive, with a bright orange epiderm and more or less redish circles and lines driving along the skin. The inside is quite green (which I didn’t expect at first and was really surprised by the colour contrast). The inside is good. The inside is inside. It happens that the plant itself is thought as a potential help/tool in breeding programs because it seems reasonnably resistant to classic virus and pests that other commecrcially important melons suffer. The problem is that they apparently don’t intercross well, and there are a lot of attempts to improve successful hybridization and things like ’embryo rescue’ protocoles (i.e., bypass natural development in hybrid seeds by taking the embryo off the seed and try to grow it in vitro on artificial media –that’s sometimes working well and allow to produce interesting plantes for backcrosses and introgressing genes of interest in commercial species). So… Pretty much everything that sorting out with regard to this species deals with technical aspects of breeding or in vitro protocoles. A good deal of technical aspects. But I learnt a few things in my quick survey. First, the fruit can be kept a long time after harvest without losing much of its fruity properties (what’s more, it has even a decrease in acidity in its late days before complete ripe). Up to three month is no big deal. Considering the price it is sold in Western market places, I was expecting a way shorter life for the fruit once cut off the mother plant. Why is it so expensive, then? (well, okay, I bought an organic one, so this account for part of the price). Three things I didn’t know this morning. (What a cool conclusion). - MENDLINGER S., BENZIONI A., HUYSKENS S., VENTURA M. (1992). Fruit Development and postharvest physiology of Cucumis metuliferus Mey, a new crop plant. Journal of Horticultural Science 67(4): 489-493. Interesting that you paired kiwano and pomegranate (Best Fruit Ever) in this post because both are unusual in that the edible part is an outer fleshy seed coat, not the actual fruit. 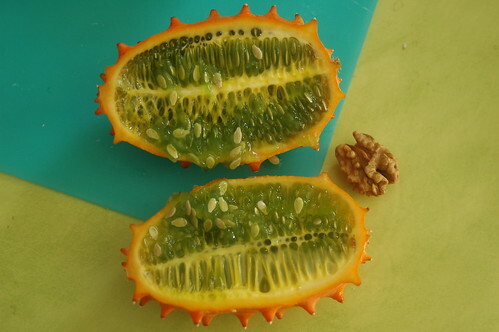 Kiwano seeds are nice in fruit salads adding a cucumber-like flavor. The expense is mostly their airfare from where ever they are grown and their a low demand that makes them still a novelty item. Thanks for helping us understand the fruit structure, DrA! My partner and I also had some hard times trying to get ovule position. Just like in pomegranate, the architecture of kiwano is quite messy. Might well go straight into our “interesting cases” category in our next fruit anatomy class. (Another surprising one is lychee, not exactly what one would expect if basing judgement on a quick external investigation… :). I need to find out how these plants are pollinated for class. any ideas?? Just buy seeds and grow it yourself. It’s a really easy plant to grow. If you’re after the leaves, you’ll have lots of them in no time.